A friend of mine is having a birthday party for her son this Saturday. I asked her what types of toys her son is into right now. She told me he loves Ninja Turtles! In fact the theme of the birthday party is going to be Ninja Turtles. She asked me if I could paint him a sign to hang in his bedroom with his name on it . Here is what I came up with. 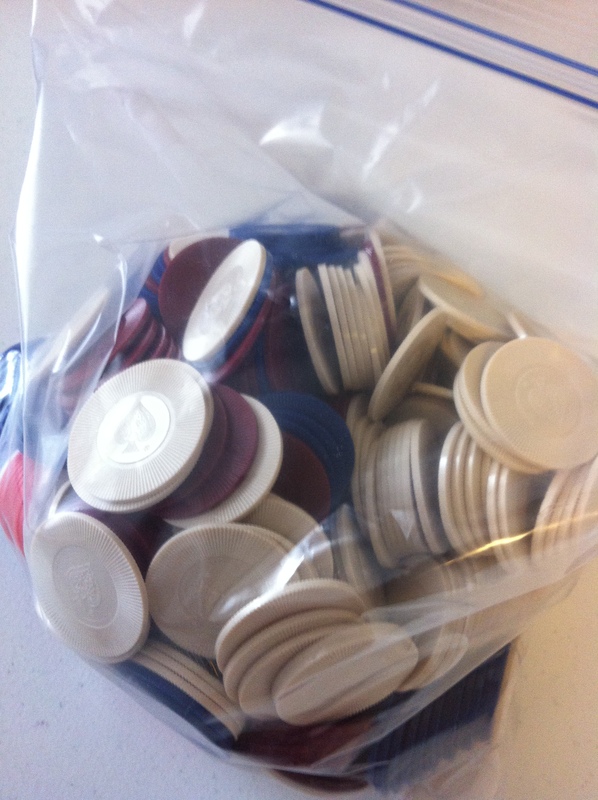 I have a ton of poker chips! I think they are great to use in making learning games. I came up with this simple game idea last night. My kids are learning the difference between uppercase and lowercase letters right now. I decided to make a game board with 26 circles printed on it. 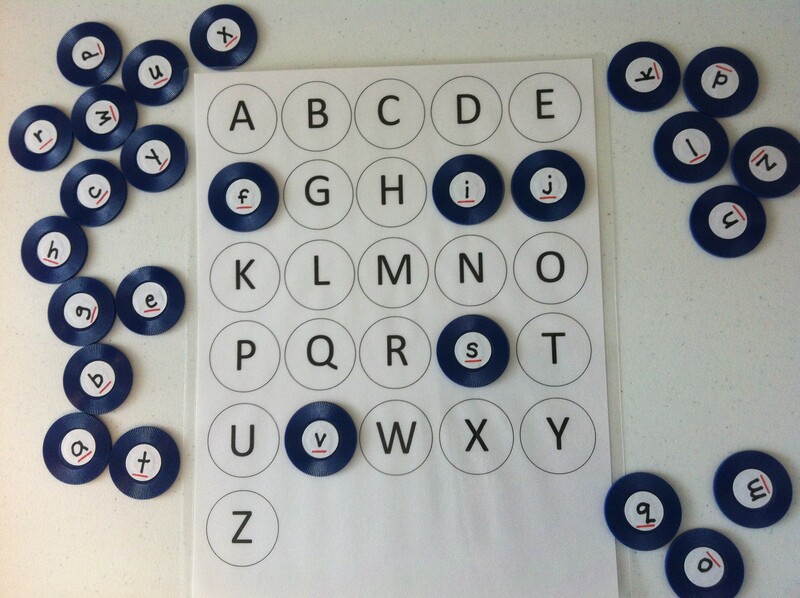 The circles are the same size as the poker chips and each circle has an uppercase letter of the alphabet in it. I then took white garage sale dot labels and wrote in sharpie marker the letters in lowercase. I attatched the white dots to the center of the poker chips. I also underlined the lowercase letters in red marker so my kids would know which direction the letters were meant to go. I laminated the game boards and now my kids are having fun learning and playing at the same time. Here is the link for the free printable. 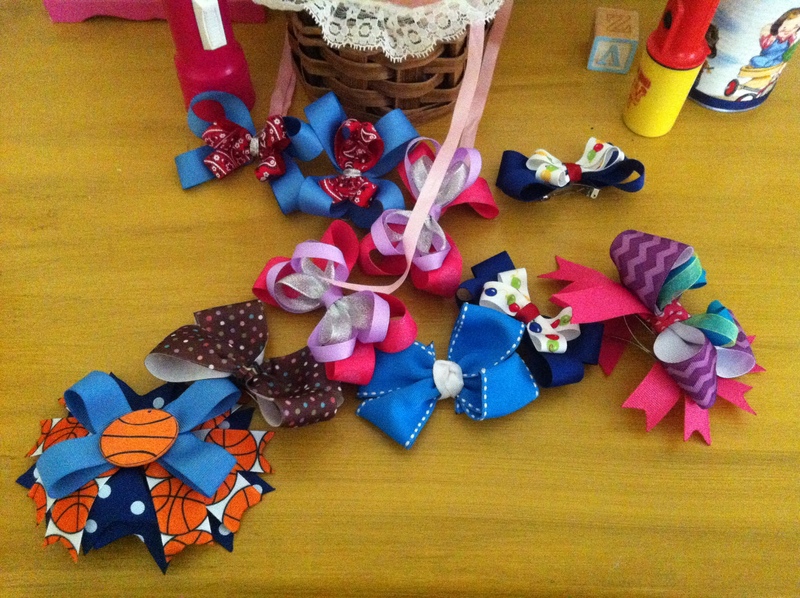 I recently have gotten into hair bow making. I think I am making up for the first 4 years of my daughter’s life where I pretty much let her walk around with her hair hanging in her face. I finally learned how to make the hair bows and now I probably will never think she has enough of them. The only problem I have had since starting to make the bows is finding a place to store them all. I had a belt hanging in her closet that I clipped them to, but it soon filled up. Then they were scattered all over her dresser. She also has a lot of headbands, other hair accessories and necklaces that I didn’t know what to do with. 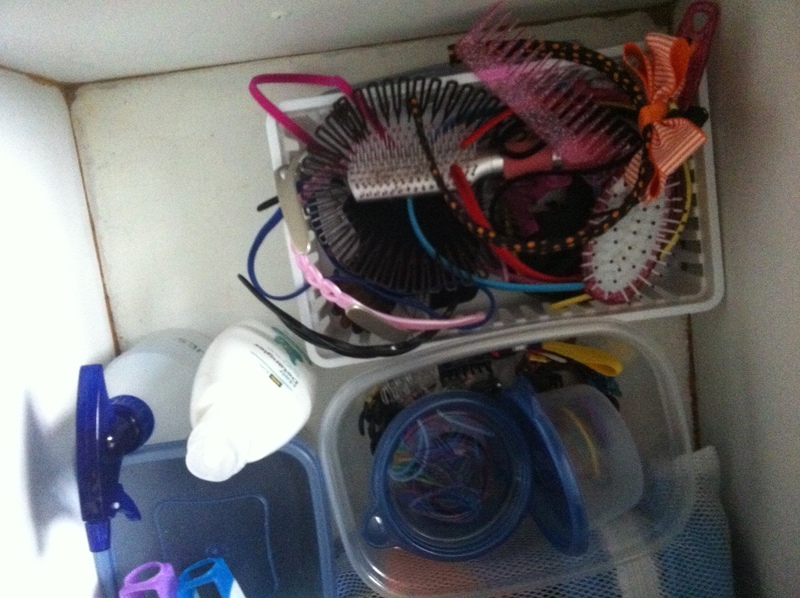 See her bathroom drawer! 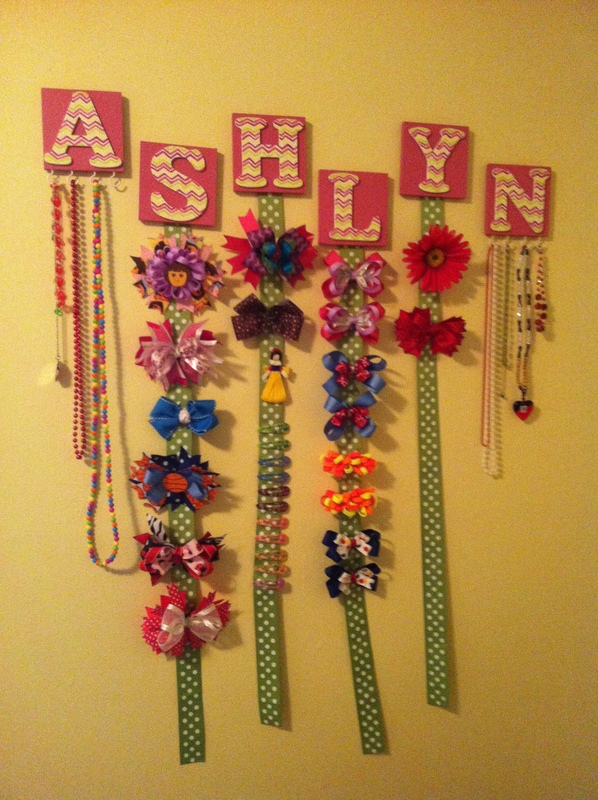 I knew I had to make a bow holder of some kind so I went on Pinterest for inspiration. I found these cute letter bow holders, this lampshade bow holder and these oatmeal canister headband holders. 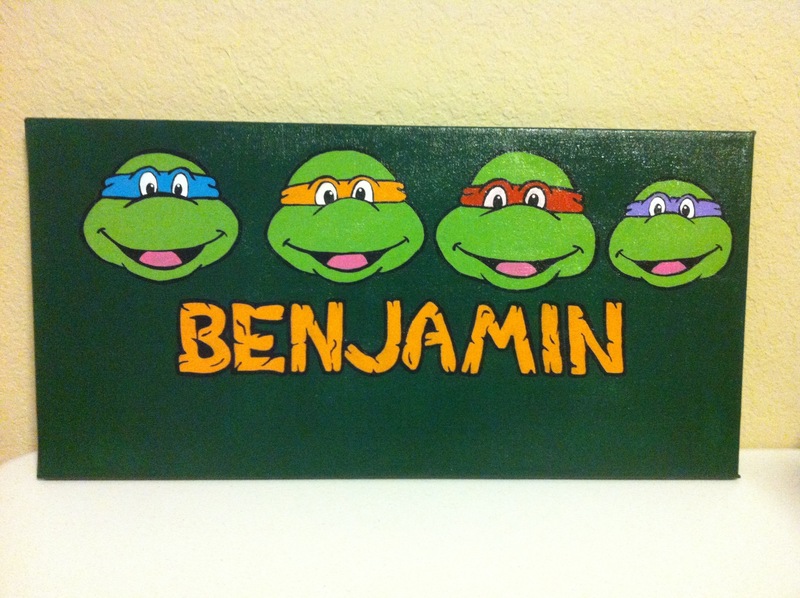 I had some wooden letters that my sister-in-law had painted for my kids when they were first born. They looked so cute in their nursery, but I thought this would be the perfect update for them to match my daughter’s room now. 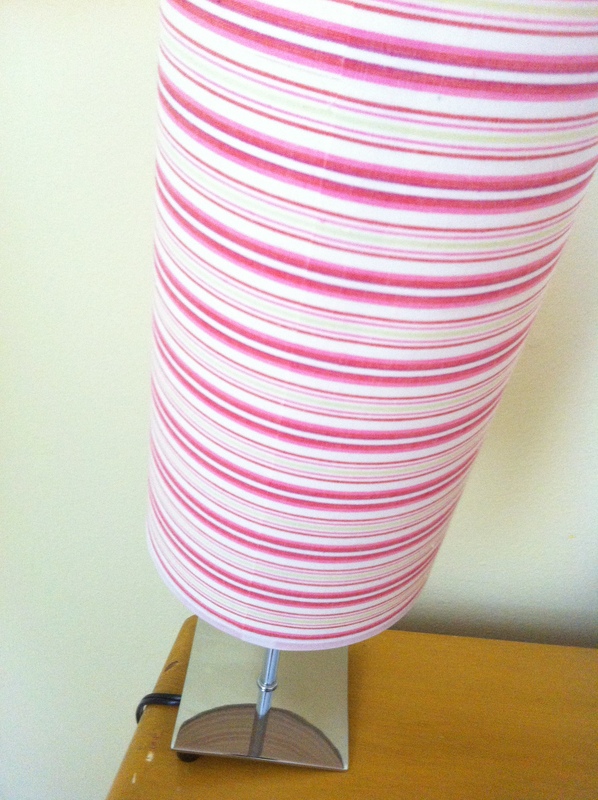 My daughter also had a lamp with a broken base. 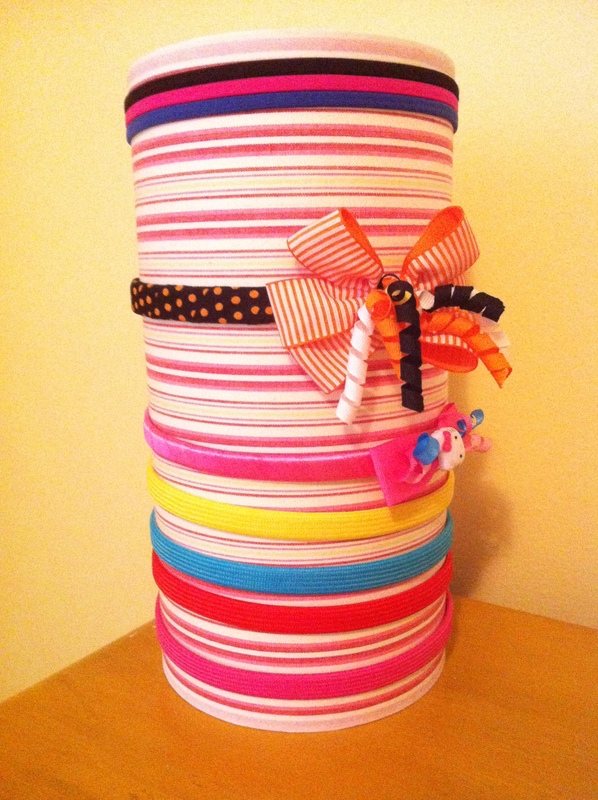 The lampshade is cylindrical just like the oatmeal canisters, so I combined the idea of the lampshade bow holder and the oatmeal canister headband holder. 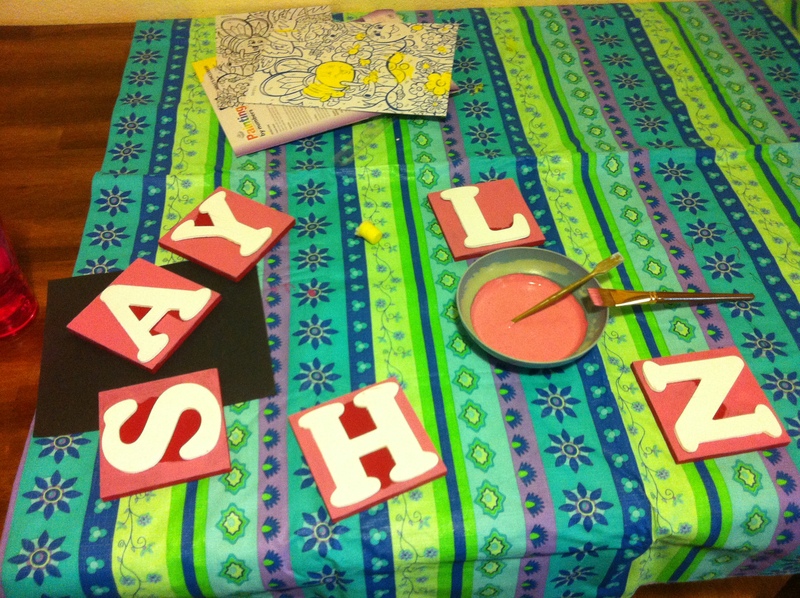 I painted the background of my letters pink. 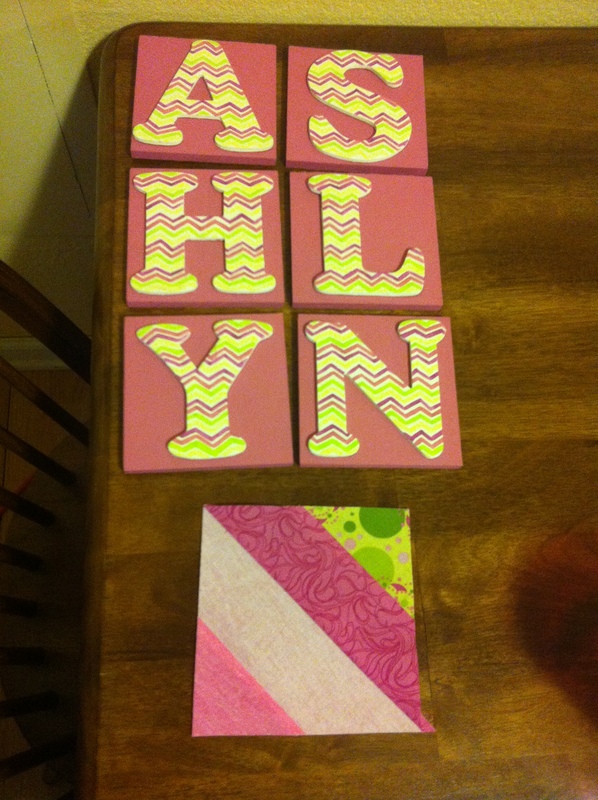 Then I painted a chevron pattern on the letters. 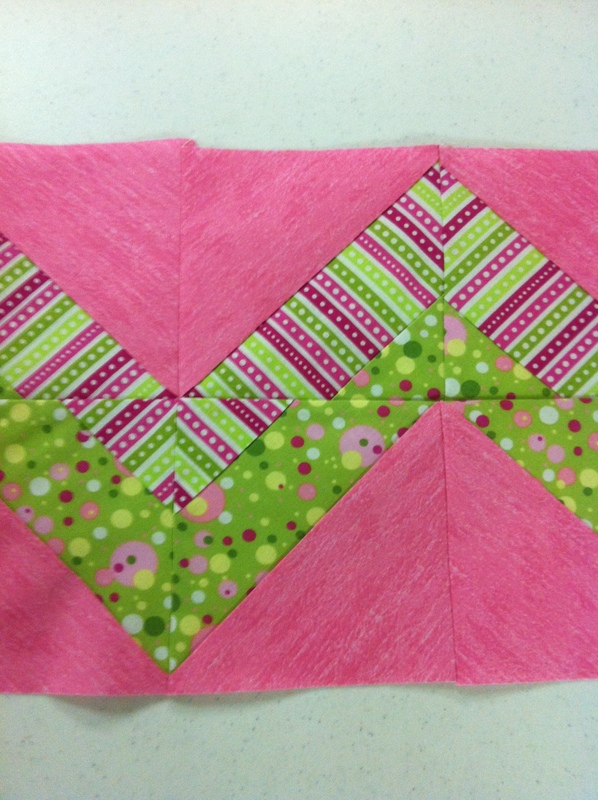 I figured if I couldn’t make the chevron work on the quilt, I might as well make it work on the bow holder. I put a sample piece of the quilt in the picture so you can see how they will go together. I am hoping to finish up on the quilt in a couple of weeks. I simply hot glued ribbon to the back of the four letters in the middle. My ribbons are 36 inches long. I added four cup hooks to each of the letters at the beginning and end of her name to use for the necklaces. I added saw tooth hangers and rubber bumpers to the back of each square. Now I’ve got that tongue twister in my head…rubber baby buggy bumpers. I hung them kind of wonky so I didn’t have to stress out too much over getting it all perfectly straight and level. 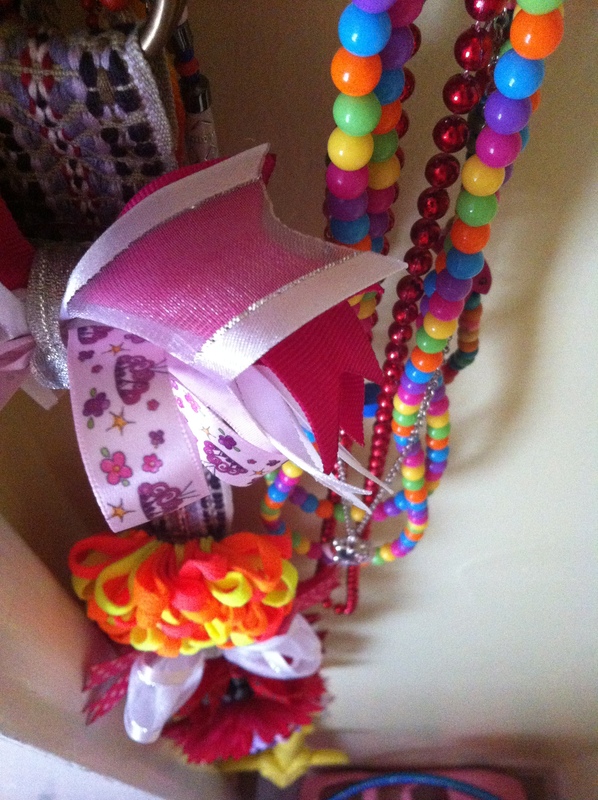 Then I organized all of her headbands onto the lampshade. I organized her brushes, combs, water spray bottle and spray conditioner in one of my Herbalife containers and simply slid the lampshade down over the top. Now I just have to figure out what I want to put in that empty drawer in the bathroom! This is a simple technique that was inspired by some of the cake decorating ideas I have seen on Pinterest. The ones where they take a stencil or a cookie cutter and then apply powdered sugar or sprinkles and you are left with a cute design. Here is one example. I was trying to come up with something cute to serve along side our Valentine’s day lunch. 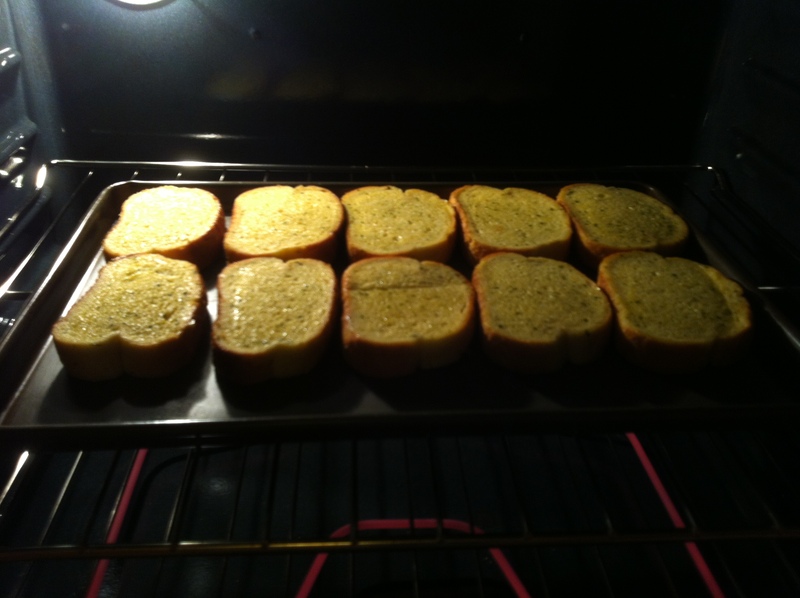 I had already planned to serve garlic bread, so I thought why not use the same technique but with something savory like paprika. Preheat your oven to 350. 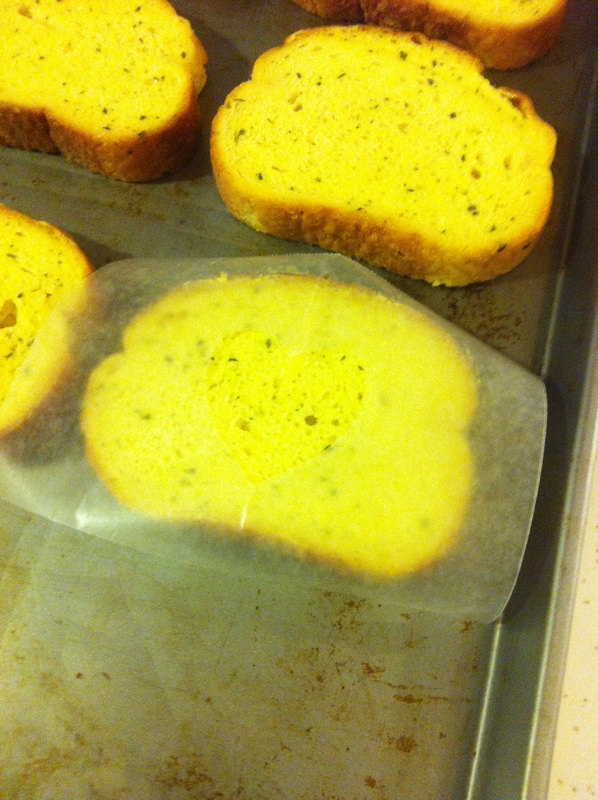 Lay out your garlic bread on a baking sheet. Cut out a rectangle of waxed paper large enough to cover the individual pieces of bread. Cut a heart out of the middle of the rectangle. 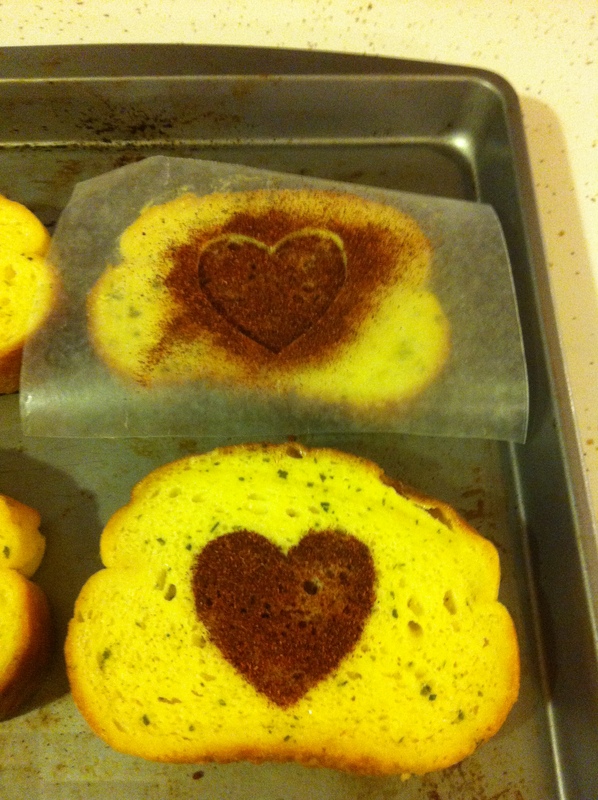 Lay the waxed paper stencil on top of the bread and sprinkle on the paprika. Carefully move the stencil to the other pieces and repeat the process. Bake until heated through. Enjoy! I think this would be fun to use with cinnamon toast too. I am going to try that in the near future. 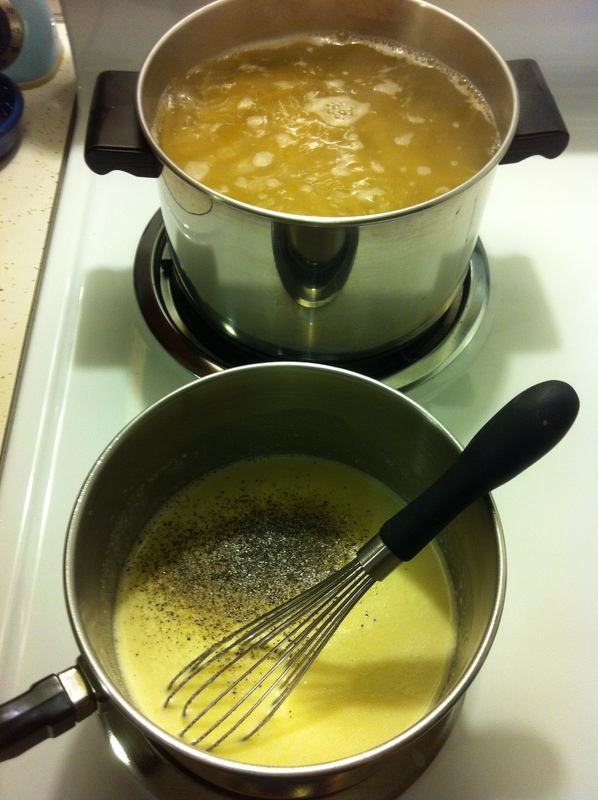 I have the easiest recipe ever for Alfredo sauce! I adapted my version from the Pioneer Woman’s and believe me it tastes just like what you would get in an Italian restaurant. No more of that jarred stuff. I can do spaghetti sauce in a jar, but something has always turned me off of that alfredo sauce in a jar. This recipe reminds me of Truvy’s cuppa, cuppa, cuppa recipe off of Steel Magnolias. Only here it is all ones. One pound, One stick, One cup, One Cup…so easy to remember! 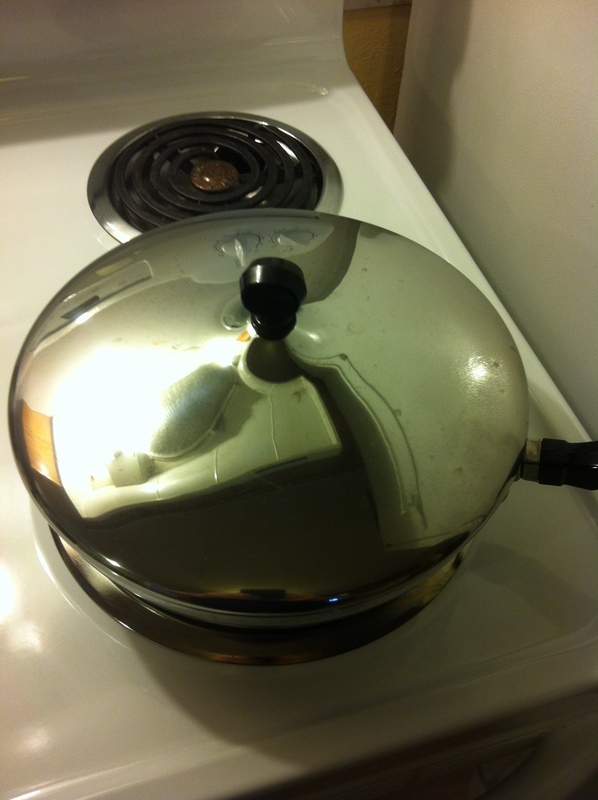 Start by putting your pot of water on to boil for your pasta. 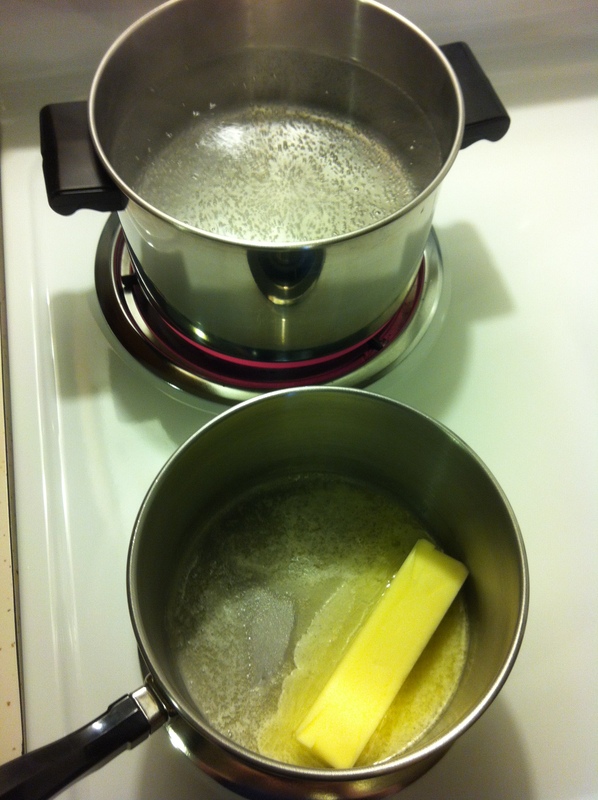 Then melt your stick of butter in a medium saucepan. 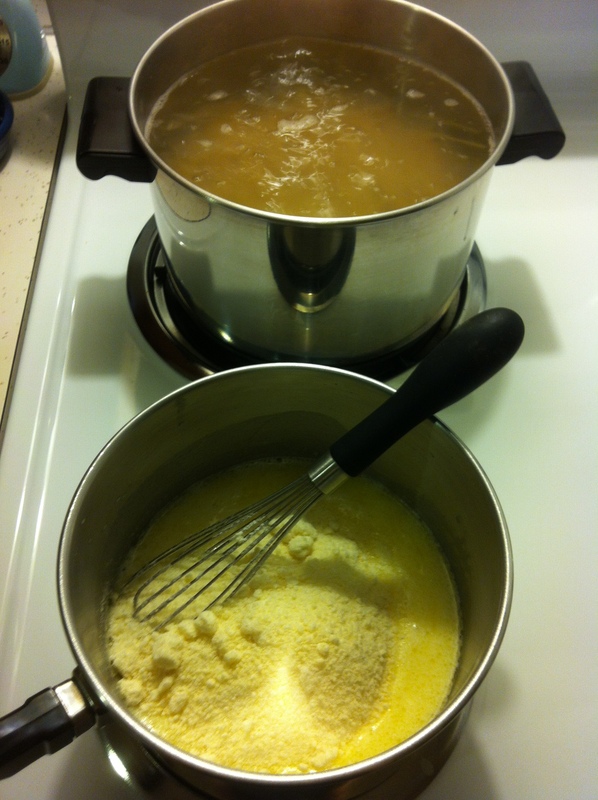 Once the butter is melted add in your heavy cream. Whisk that together and add in your Parmesan cheese. Once your pasta water is boiling add your pasta to that pot. After your Parmesan cheese is mixed in add salt and pepper to taste. 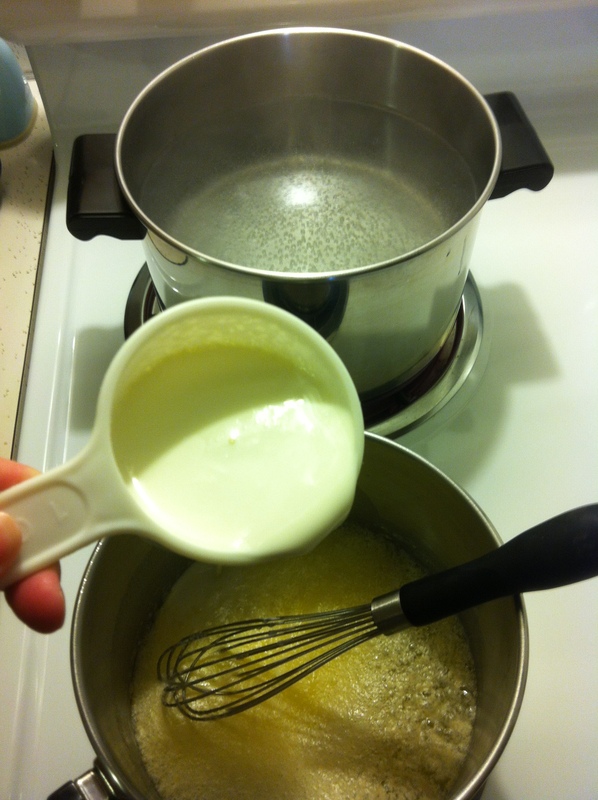 If your sauce seems too thick you can thin it down with more heavy cream or some of your pasta water. You want it to be on the thinner side, because it gets thicker as it cools down. Add your sauce to your pasta and you are ready to eat. My kids love just the noodles and sauce, but I decided to make some Cajun chicken to put on top of the adults pasta. It made it even more out of this world! Season the chicken liberally with the seasoning. 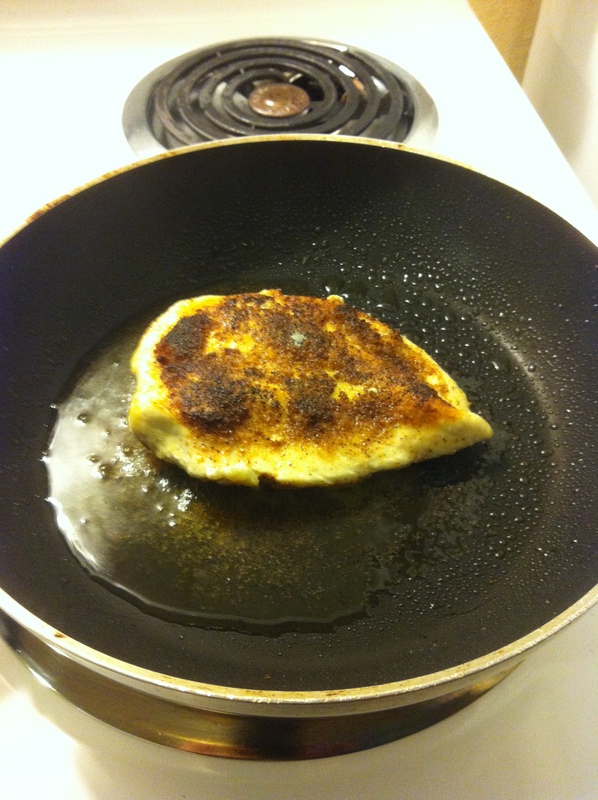 Place the chicken breast in a hot oiled skillet. Let brown on one side and flip over. Once the chicken is browned well on both sides, cover the pan with a lid and cook on medium to medium low while you prepare the pasta and sauce. 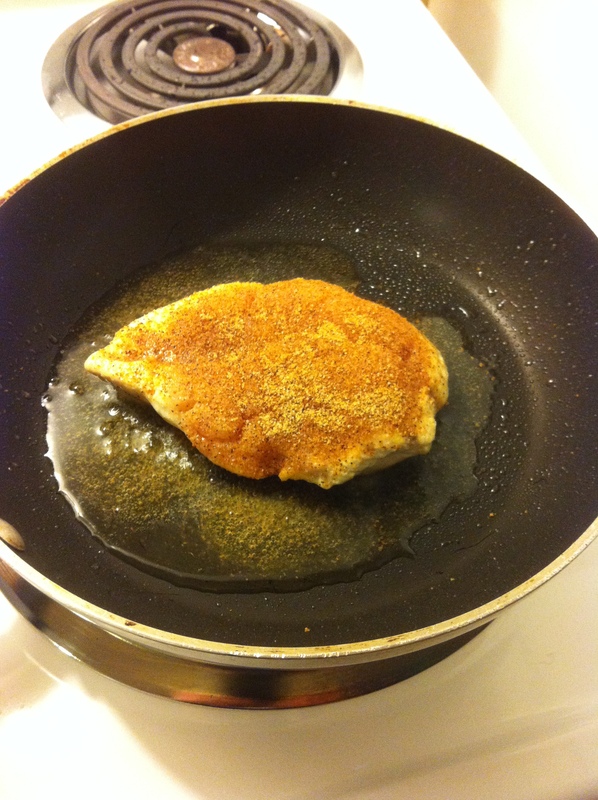 When done slice the chicken breast and serve over the pasta and sauce. 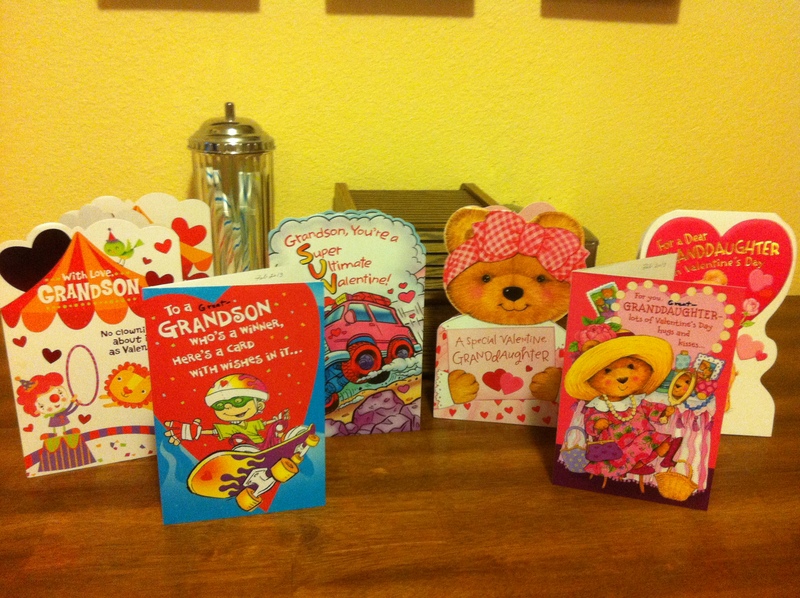 We had a great Valentine’s Day together as a family. I hope your Valentine’s Day was a good one as well. I thought I would share with you our day. 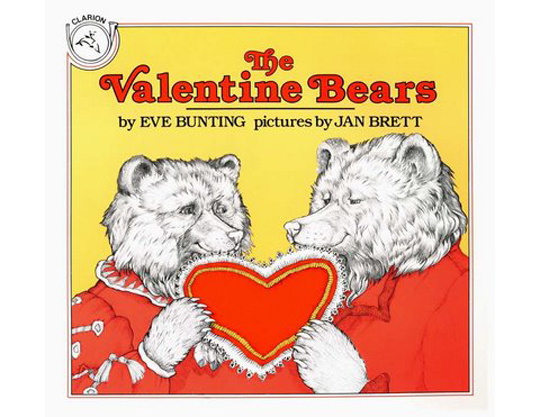 We started off the morning by reading “The Valentine Bears” by Eve Bunting and illustrated by Jan Brett. This is a book I remember reading when I was a kid. I found the picture of the book here. Then I helped the kids with a craft. We made these shape bears to go along with our story. 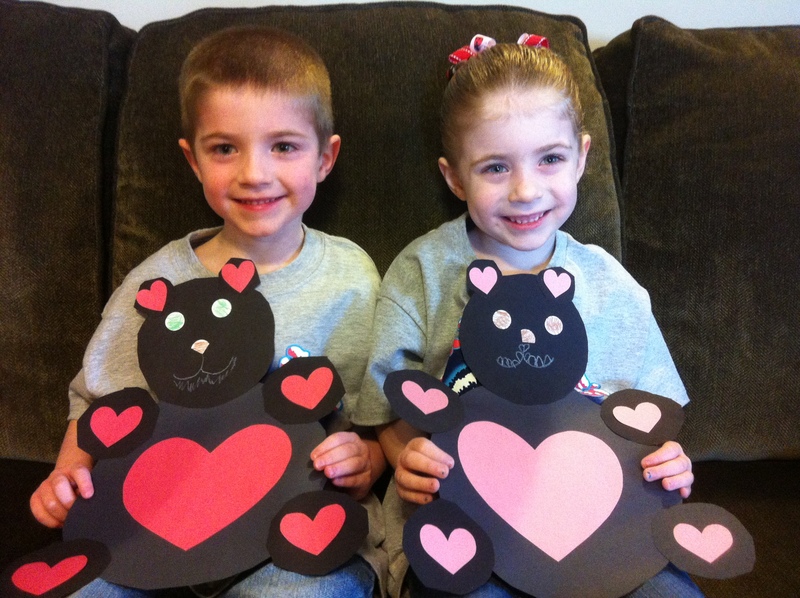 The kids cut out all of the circles and I cut out the hearts for them. Then they glued them all together. They enjoyed opening mail that came just for them. All together they each got three valentines in the mail. They were so excited! 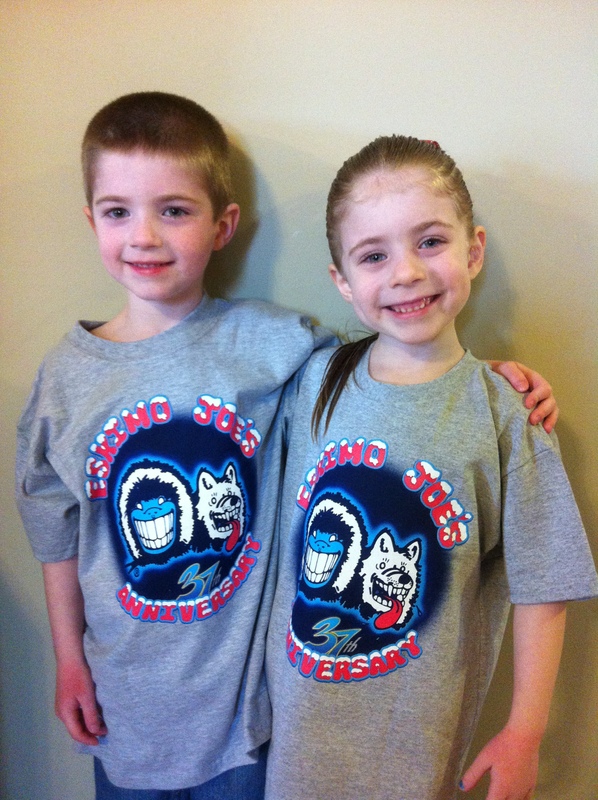 They also got new tee shirts from their Big Daddy and Gamma and money to spend from their Pa pa and Gigi. Valentines Day wouldn’t be complete without Conversation Hearts. So we did graphing with them. 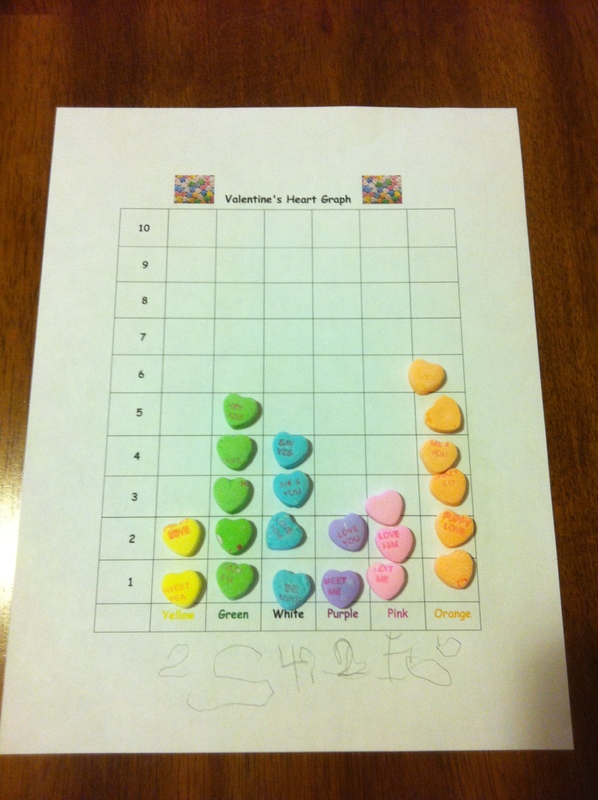 I found the printable graph on Blissfully Domestic. 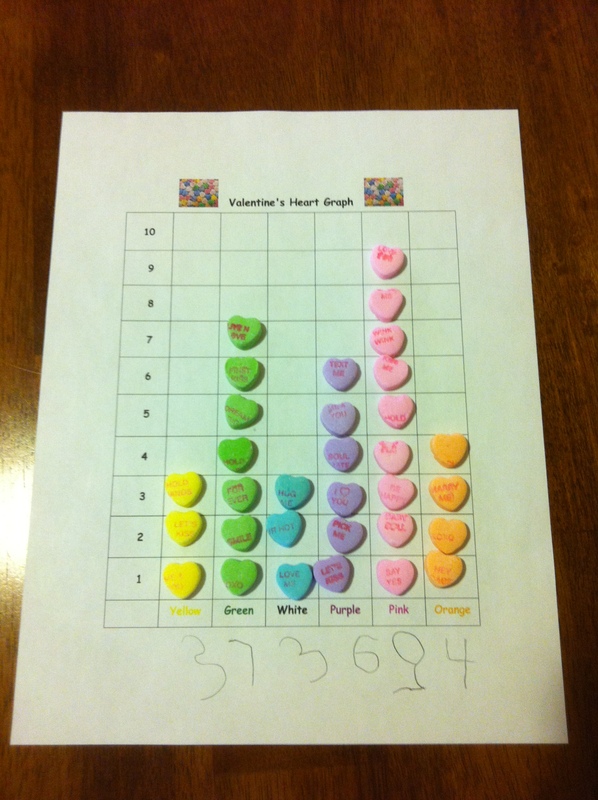 My daughter ended up with ten more hearts in her box. I thought that was quite a difference…maybe my son was eating them while I wasn’t looking. Of course the most fun they had with the activity was eating the candy. 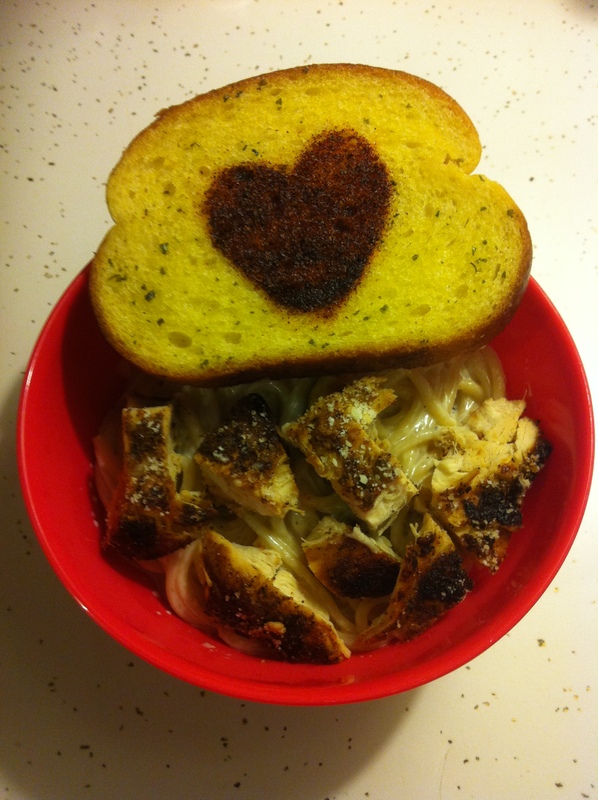 We had Cajun Chicken Alfredo for lunch. 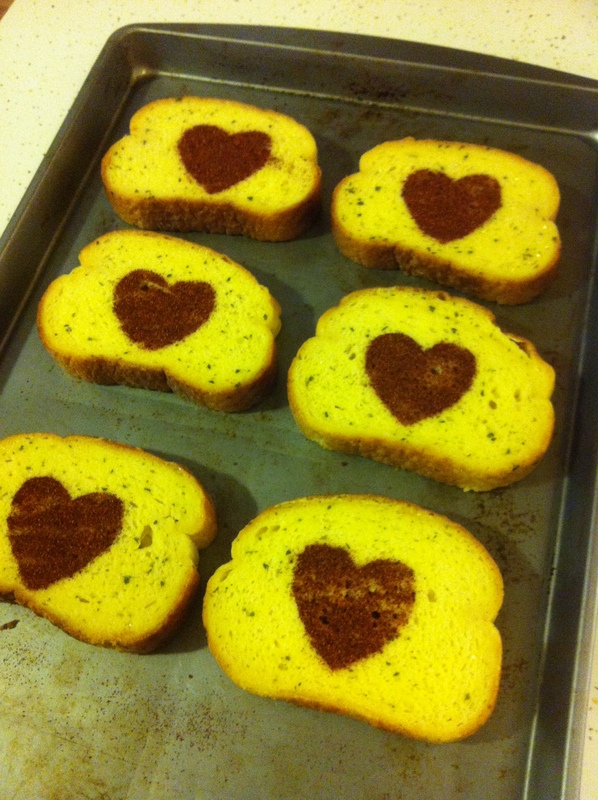 I also made garlic bread with paprika hearts. 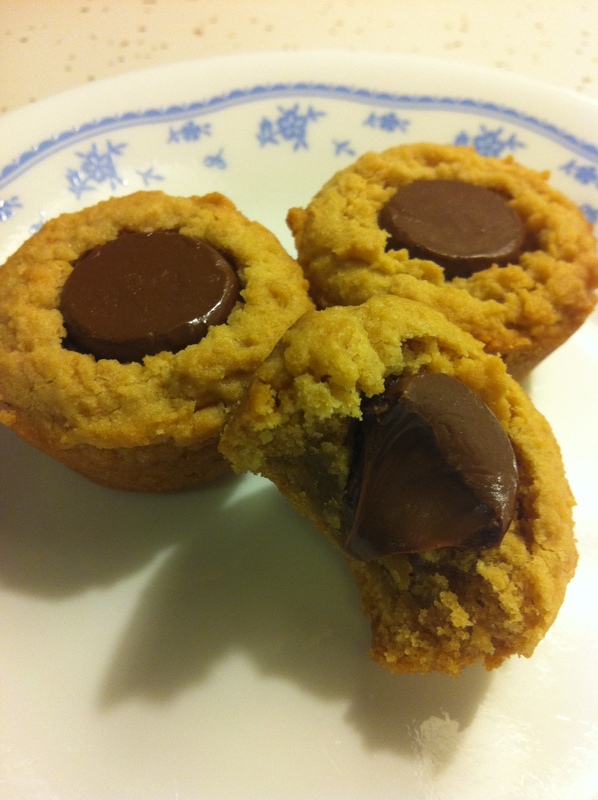 We finished off the day by making Peanut Butter Blossoms together. Only I used a mini muffin tin to bake the cookies in. They come out so cute that way and most importantly the cookie to chocolate ratio is better. Happy Valentines Day from our family to yours! 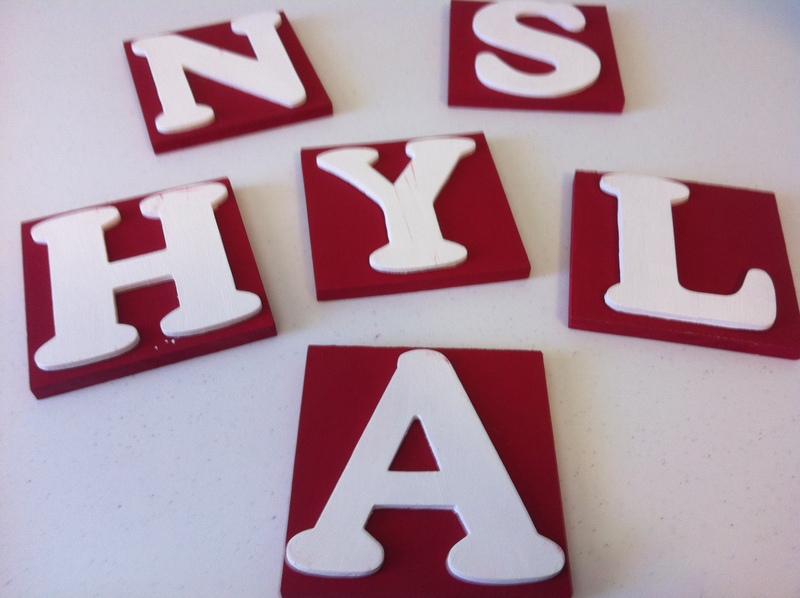 I have seen so many cute ideas for letter art on Pinterest. I thought we would try out our own version to hang above the kids desk in our homeschool room. Here are links to some of the examples that inspired me. This one uses watercolor to paint over a masking tape name. This one uses homemade edible finger paint. This one uses printed fabric for the background and then when you paint over stickers with black paint and remove the stickers the words are revealed. 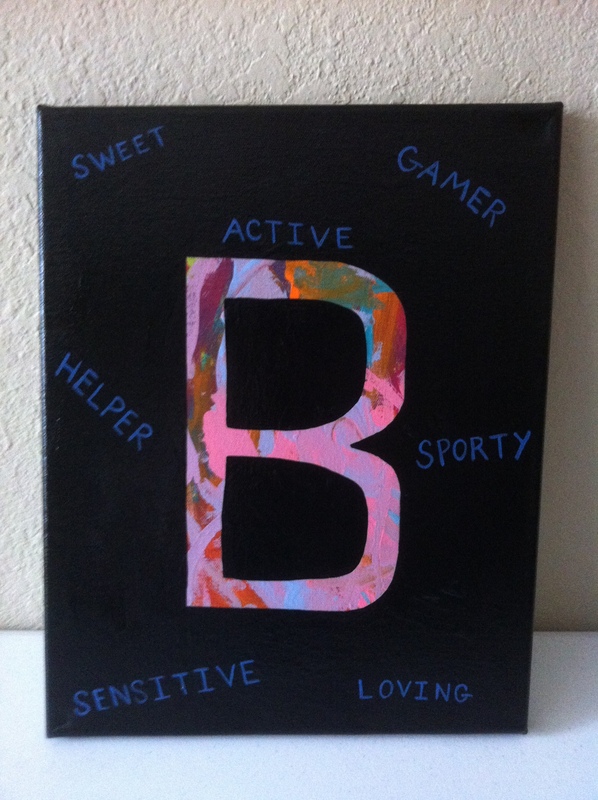 I decided to let the kids paint whatever they wanted onto a canvas. I then drew a simple letter with a pencil outline. They are still learning their letters so I wanted the font to be simple. I painted around the outline with black paint so that the only thing left showing was the letter. 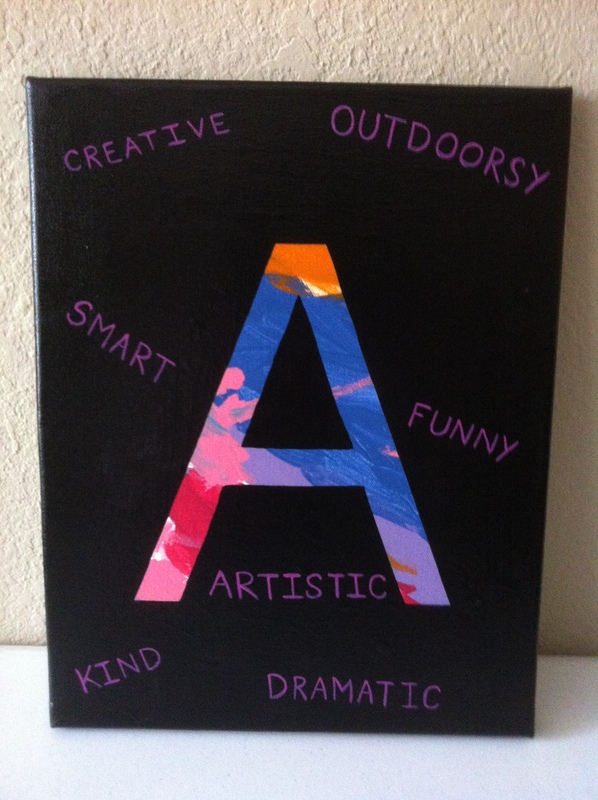 Then I came up with some adjectives that describe each child and painted them in the same simple font around that childs letter. I used purple for my daughter and blue for my son. Lastly I gave each canvas a good coat of Mod Podge. I think these will look great hanging above their desk! I love to organize! My husband tells me all the time that I have OCD and I am beginning to believe him. I thought I would share with you some of my favorite ways to organize things. Just the other day we rearranged our homeschool room and there was this awkward space left next to my desk. 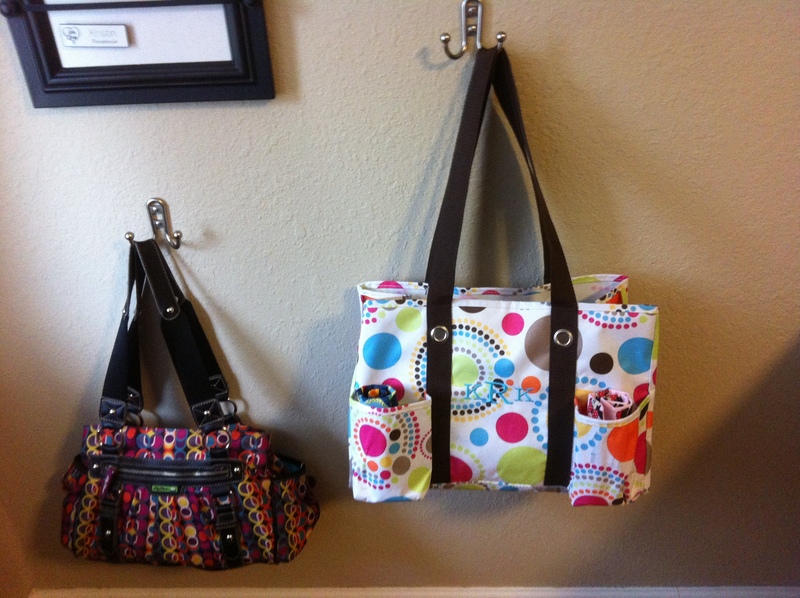 I have always needed somewhere to put my purse and bag so I thought why not hang some robe hooks and hang them on the wall. That is how this idea was born. My husband and I are on this diet called Herbalife and the shake mix comes in these great containers that are just the perfect size for pencils, colored pencils, markers, you name it. They are just great. Before we know it I will be storing everything in these. I also love to use Velveeta boxes to organize things in (you are probably saying “didn’t you just say you we’re on a diet” “Velveeta and diet don’t go together”…well we all have our shortcomings.) Velveeta boxes are great for filing paper things like receipts or recipes. 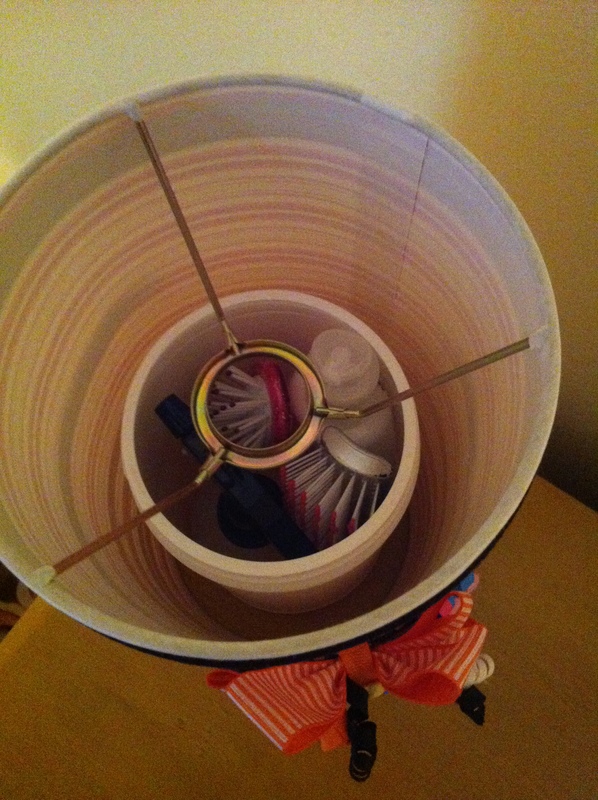 They are also good for small items in a junk drawer like clothes pins or rubber bands. 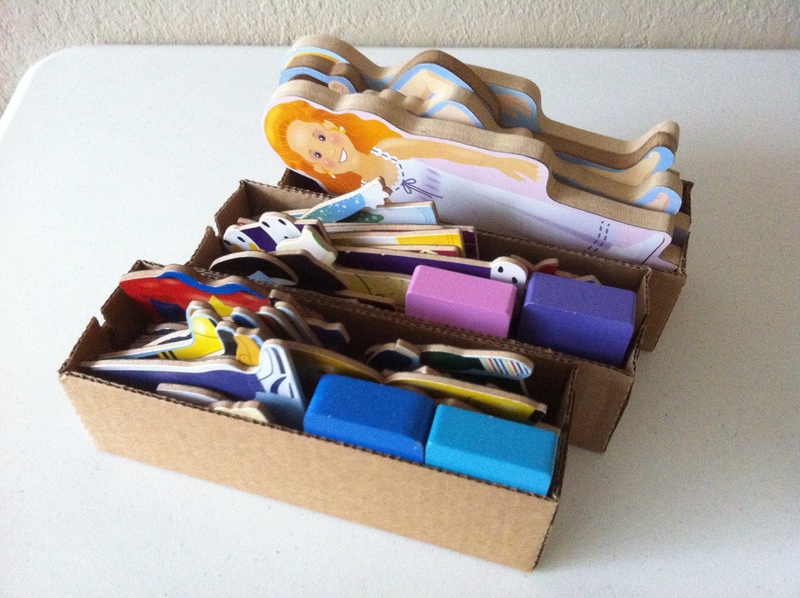 I found they worked perfectly for our Melissa and Doug Magnetic Dress Up Playsets. 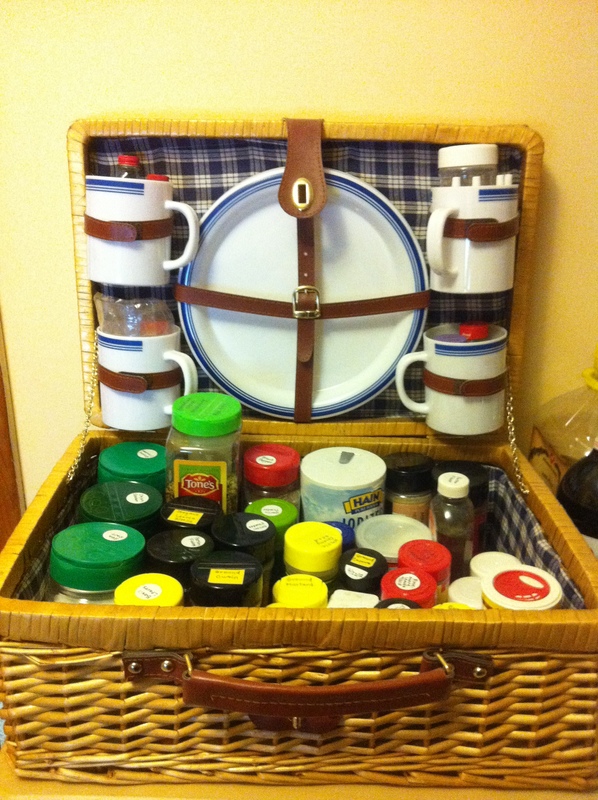 In the kitchen I organize my spices in an old picnic basket. 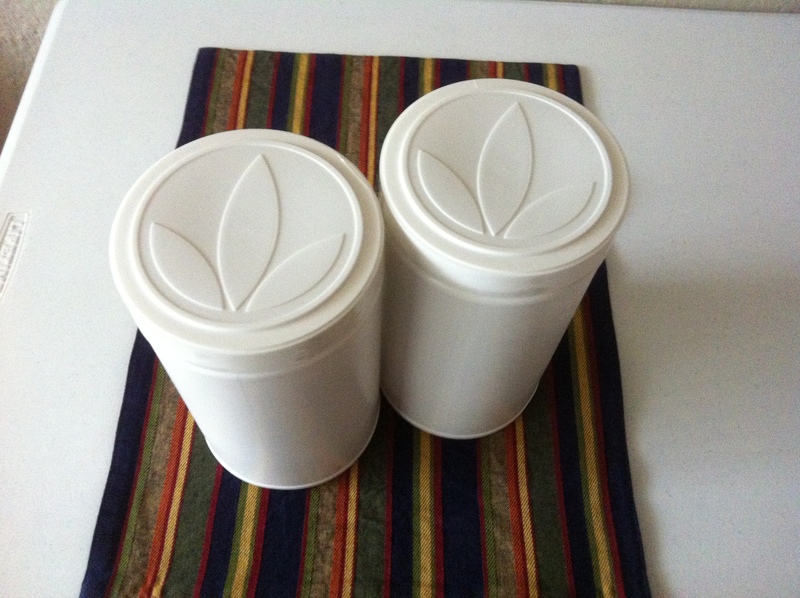 It gives the picnic basket new life and gives me a handy place to store all of my spices. I even use the cups that are buckled to the lid to store small things like sprinkles and food coloring. 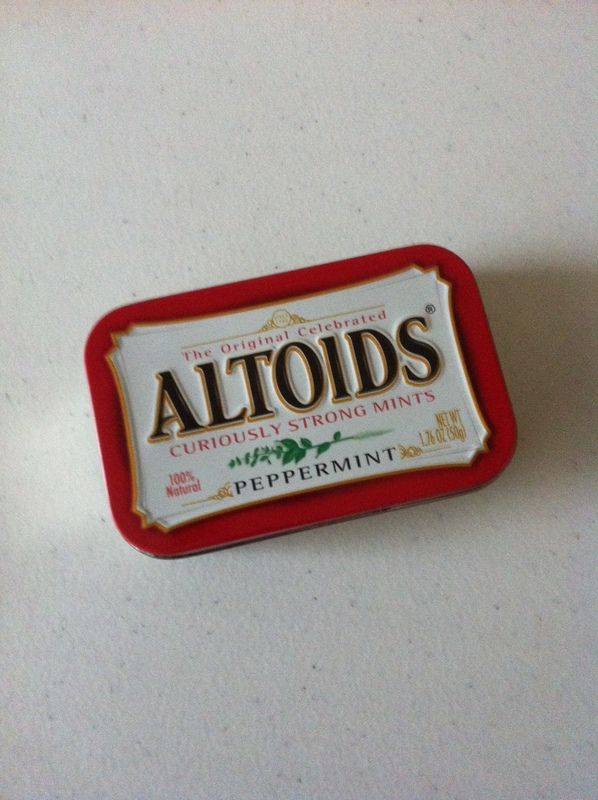 The final way idea I have for you today is using Altoid tins. 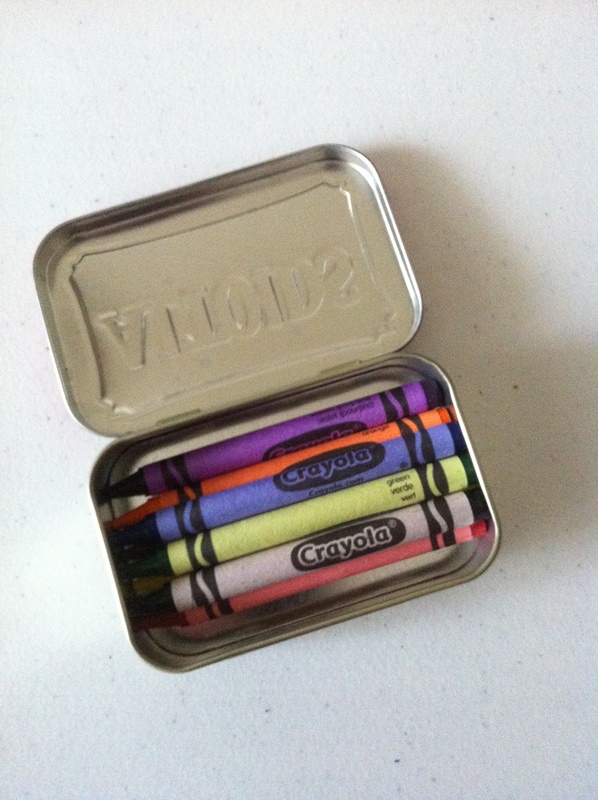 These tins are useful for so many things. I have seen lots of ideas on Pinterest for things like sewing kits and first aid kits. I am going to use mine to store 8 count Crayolas for my Bible class. That way each child can have their own little box to use during class. I would love to hear some of the ways you organize things in your home! 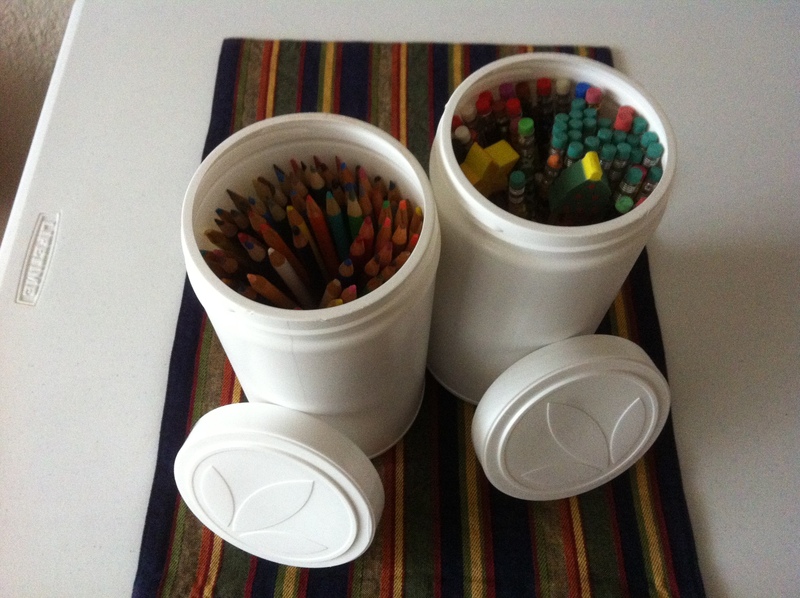 Do you have any other ideas for using recycled containers for organizing? I am always looking for creative ways to organize my stuff. I got together with my friends yesterday, so my friend’s mom could teach us how to quilt. I think I have found a new hobby. 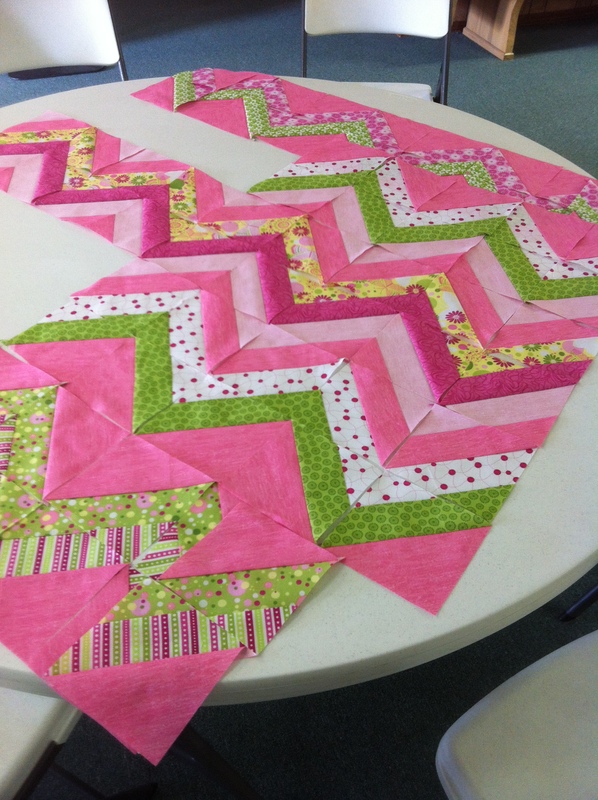 Quilting is so much fun! We used a video tutorial off of YouTube that made it really quick and easy. Here are some pictures of what I have gotten done so far. I laid my blocks out in this fantastic chevron pattern. I was so excited to see it all come together! Then when I sewed my first two rows together this is what happened. The inner points of the chevron don’t meet up right. I have tried to figure out a way to fix this, but I don’t know how. If any of you more advanced quilters know a way to make it meet up right I would love to know what I was doing wrong. 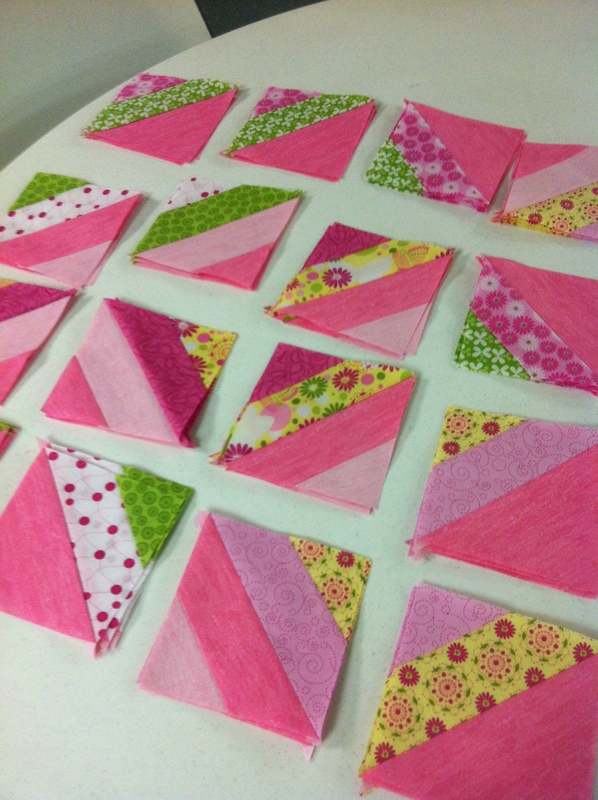 Here are the same blocks before I sewed them together. At the end of the day I laid out all of my blocks to see what I had. I will be making this quilt to use as a new bedspread for my daughter’s room. I think the thing I like most about quilting is laying out the blocks and seeing what patterns you can make with them. I am excited to see how this quilt turns out. If you have ever wanted to learn to quilt, I highly recommend this method of tube quilting. 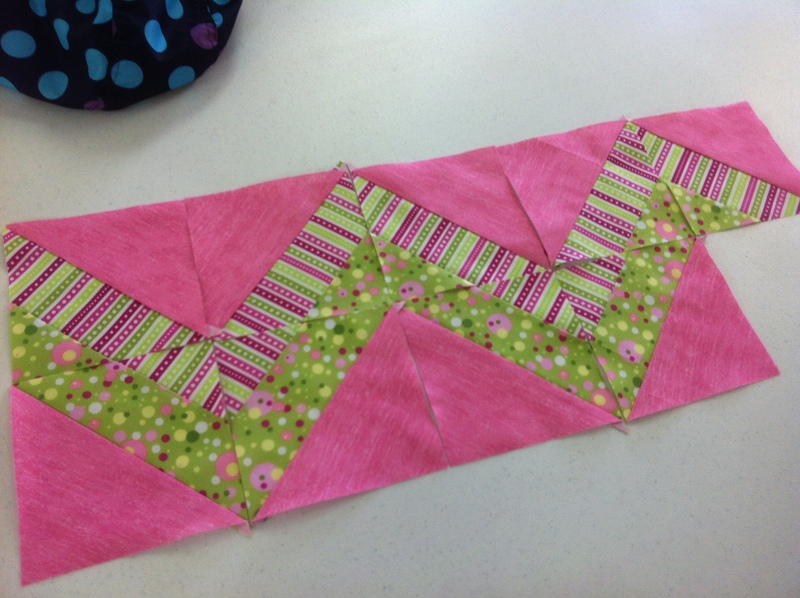 Although the chevron pattern didn’t work for me in the end, the tutorial was great for teaching a beginning quilter the basics of the hobby. I’m so excited! Not only do I get to have a girls day today, but we are going to be learning how to make quilts. I have always wanted to learn to quilt. I just have never taken the time to do it. This is the tutorial we are going to be using. It looks simple enough for a beginning seamstress like myself, but also seems like a great way to make blocks quickly and efficiently for a more advanced quilter. My husband will be watching our twins while I am with my friends. It is nice to have something easy on hand for him to prepare for lunch. My husband has lots of things he would rather be doing than preparing a gourmet meal, and my kids enjoy fun dad food. Everyone is happy! Pizza Toppings – Pepperoni, Sausage, Olives, Onions, Bell Peppers, etc. 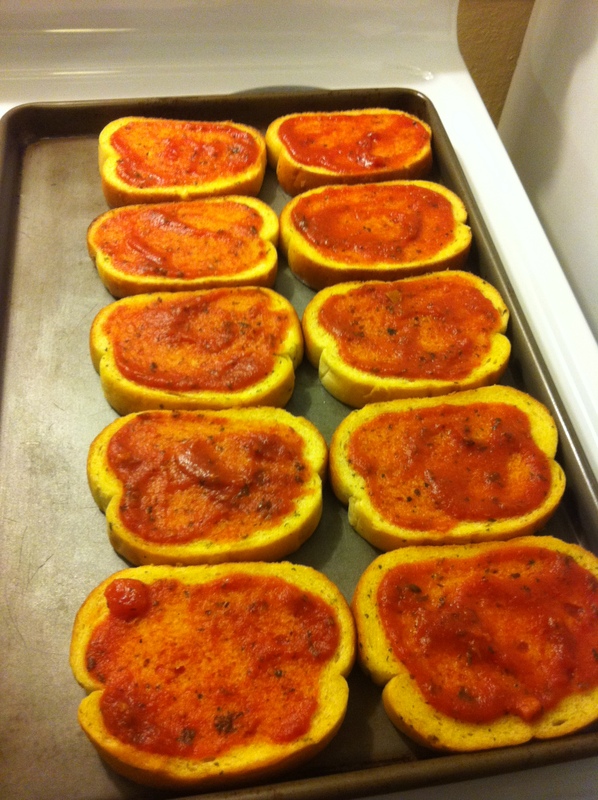 To make the pizzas, place your garlic bread on a baking sheet and bake according to package directions. Once the bread is done baking. 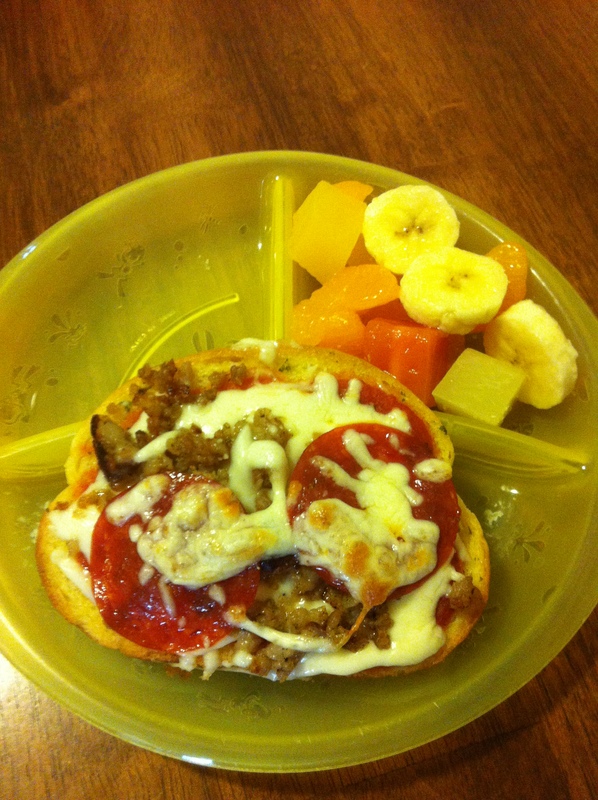 Top the bread with sauce, cheese and desired toppings. 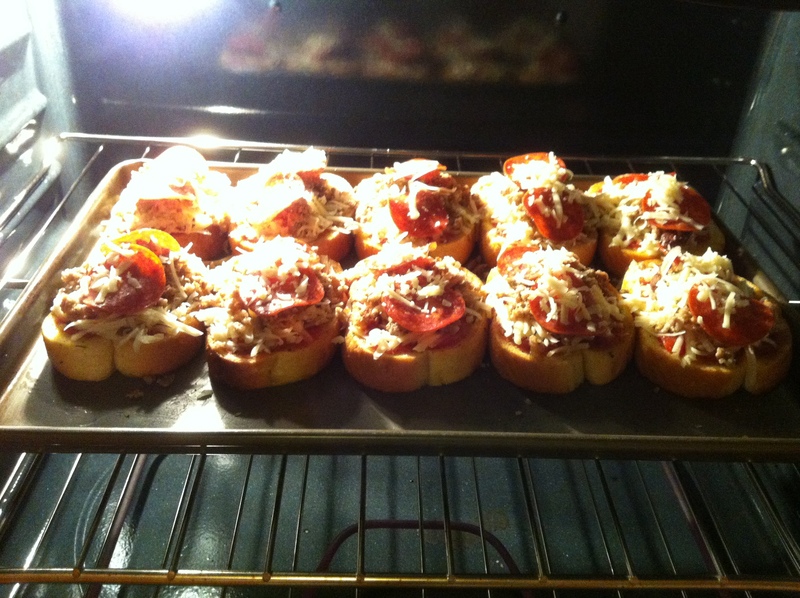 Bake in the same preheated oven until the cheese is melted and the toppings are hot. My kids love these pizzas. I hope you enjoy them too!